A Verbatim Magazine documentation of the killing of two Catholic priests and about 7000 others by herdsmen terrorists and the Boko haram group in Benue, Taraba, Kaduna, Adamawa, Maiduguri, Birnin Gwari, Nasarawa, Plateau, Enugu and many other parts of the country. As President Muhammadu Buhari administration turns 3 years on May 29, this year, one black spot in his regime, which will remain unforgettable in the minds of Nigerians will be the incessant, unabated shedding of innocent blood of Nigerians under his watch. A documentation of the various incidents nationwide by Verbatim magazine reveals that over 7000 innocent souls, including two Catholic priests in Benue State, were sent to early graves in the last three years. The Catholic Diocese of Makurdi in Benue State which confirmed the killing of the two priests identified them as Joseph Gor and Felix Tyolaha. They were killed in an early hour attack on April 22, 2018 at St Ignatius Quasi Parish, Ukpor, Mbalom in Gwer West Local Government Council of Benue. A statement by the diocesan Director of Communications, Moses Iorapuu, said the attacks were perpetrated by herdsmen who stormed the Mbalom community and killed the two priests during the morning mass at the church. 17 other worshipers who were observing the morning Mass were also killed alongside the priests. The 19 were later given a mass burial on Tuesday at Se Sugh Maria Pilgrimage Centre, Ayati Ikpayongo in Benue State. In attendance was the Vice-President Yemi Osinbajo, who conveyed President Muhammadu Buhari’s condolence message to the Catholic Church and the people of Benue. Osinbajo, while lamenting the killing said, though nothing could be done to restore the lives of the slain, “We can ensure justice for them by apprehending and punishing the assailants.” He added, “What manner of man is he that wakes up in the morning determined to kill innocent men and women? Surely, such one has lost his peace; he is to be condemned and cursed”. Reactions from the Church and the larger Christian, family was widespread. The Christian Association of Nigeria, CAN, called on Buhari to suspend his second term ambition, till he had addressed and stopped the killings by herdsmen. CAN, in a statement by its spokesman, Pastor Bayo Oladeji, said, “While CAN is not opposed to the President’s exercise of his civic right by seeking re-election for the second time, we urge him to halt it for now and attend to the security problems occasioned by the criminal activities of the terrorists, herdsmen and bandits. The organisation asked President Buhari to suspend his re-election bid until he restores sanity to the country while ensuring the release of Leah Sharibu, the remaining Dapchi girls and other hostages from the captivity of the Boko Haram terrorists. 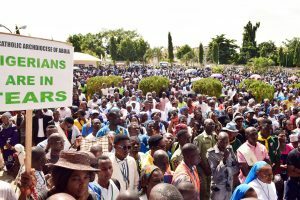 Catholic faithful across the country embarked on peaceful protests in compliance with the directive by the Catholic Bishops’ Conference of Nigeria. The Bishop of the Catholic Diocese of Abeokuta, Ogun State, Olukayode Odetoyinbo, and his counterpart in Jalingo, Taraba State, Charles Hammawa, demanded Buhari’s resignation for failing in his responsibility of protecting lives and property of Nigerians. Speaking during a requiem mass at St. Anne Catholic Church, Ibara, Ogun State, Odetoyinbo noted that after the April 24 attack in Benue, more people had been killed by marauding herdsmen across the country with the government feeling helpless. He said, “We asked the President to resign because he’s the father of the nation, when the father cannot protect his home, what’s the responsibility of a father then? He argued that “the duty of the President is to protect Nigerians; we entrusted the lives of Nigerians into his hands; not only economy, not money but lives. But if a father cannot do that, it is obvious that you are not able to keep the promise as expected. In Jalingo, Hammawa spoke in the same way. Speaking at a requiem mass held at Our Lady Queen of Peace cathedral, He noted, “These continuous killing of innocent people, while our elected leaders look the other way, is an act of betrayal, an act of blasphemy against God. In his remarks, Samuel Ortom, the Benue State Governor, lamented that the Tuesday mass burial was the third that the state would conduct within the last five months, putting the number of those killed by herdsmen at 492. “What is the offence of the priests and the parishioners? Perhaps the Church now grows grass to feed their cattle or the parishioners were in the farms,” Ortom wondered. He said the state would neither back down on its anti-open grazing law nor stop to demand justice for those killed. The high death toll was traceable to activities of Boko Haram insurgents and Fulani terrorist herdsmen and the situation has kept escalating since President Muhammadu Buhari assumed office on May 29, 2015. Findings by our correspondents across the country, coupled with media reports indicate that the masterminds, Boko Haram insurgents and Fulani herdsmen were most deadly in their attacks in Benue, Taraba, Kaduna, Admawa, Birni Gwari, Enugu, Nasarawa, Plateau and other parts of the country in the period under review. It was also discovered that thousands of persons, including women and children, sustained various degrees of injuries from the attacks. Killings in Benue had been regular and incessant this year. Apart from the widely reported massacre in Agatu, many other parts of the state witnessed attacks by the killer squad of Fulani herdsmen. The deadly attacks, spanning three years now in the administration of Buhari, first came to the fore in the last days of May 2015, after President Buhari’s inaugural speech. The deadly Boko Haram sect struck soon after, killing 97 persons and injuring several others. In June, July, August, September and October 2015, the sect killed 368, 635, 431, 267, and 279 persons, respectively. But starting from November 2015, the number of persons reportedly killed by the sect dipped with November 2015 recording 81 deaths; December, 136; January 2016, 104; February 2016, 90; March 2016, 26; April 2016, 43; and May 2016, 12. In 2015, Nigeria ranked third in the 2015 Global Terrorism Index, trailing Iraq and Afghanistan. According to the index, on June 4, 2015, a female suicide bomber in Maiduguri killed two people near a military checkpoint. On the same day, 45 people were also killed in a Yola market, Adamawa State when a blast ripped through the place. On July 1, 2015, suicide bombers attacked a hospital in Kukawa, Borno State when Vice-President Yemi Osinbajo visited the state, killing 118 people. Also on July 17, 2015, 50 persons were killed when suicide bombers attacked a Muslim prayer ground in Damaturu, Yobe State. One of the worst Boko Haram attacks in 2016 include an attack on Dalori village, some four kilometres from Maiduguri, Borno State on January 30, 2016, where at least 86 people were reportedly killed after an invasion by the insurgents. On February 9, 2016, 60 people were reportedly killed while 78 others were wounded when two female suicide bombers suspected to be Boko Haram members, sneaked into a camp for internally displaced persons in Dikwa, Borno State. However, the situation did not apply to the casualty figures associated with Fulani herdsmen attacks. June 2015 recorded 97 deaths arising from suspected Fulani herdsmen attacks; September recorded 3; October, 18; November, 22; December, 28; February 2016, 300; April 2016, 55; and May 2016, 3. In February 2016, suspected Fulani herdsmen attacked a village in Agatu, Benue State, reportedly killing at least 300 persons. The attack has been described as one of the worst ever witnessed in the series of attacks by Fulani herdsmen. In April, 2016, at least 40 persons were also reportedly killed when suspected herdsmen attacked Nimbo in Uzo-Uwani Local Government Area of Enugu State. About seven villages in Nimbo including Ugwuijoro, Ekwuru, Ebor, Umuome and Ugwuachara were among the areas attacked. No fewer than 10 houses, including a church were also said to have been burnt in the attack. In the same month, suspected Fulani herdsmen also attacked Dori and Mesuma villages in Gashaka Local Government Area of Taraba State, killing at least 15 people, according to the police. Although, residents said more than 40 persons were killed and several houses razed by the assailants. On Friday, May 20, 2016, Fulani Herdsmen killed two persons and six others injured following an attack on Oke Ako in Ikole Local Government Area of Ekiti State. 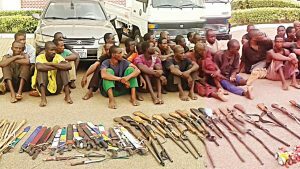 It was alleged that the assailants attacked their victims for refusing to allow the herdsmen use their farmland for grazing their cattle. However, Governor Kashim Shettima of Borno State puts the number of deaths at over 100,000 persons suffered by the state due to the Boko Haram insurgency. Shettima gave the data at the annual Murtala Mohammed memorial lecture held at the Shehu Yar’Adua Centre in Abuja in 2017. The governor, who delivered a paper “Managing the Boko Haram Crisis in Borno State, Experiences and Lessons for a Multiparty, Multi-ethnic and Multi-religious Nigeria”, said the number of the dead was based on estimates by community leaders in the state over the years. “The Boko Haram insurgency has led to deaths of almost 100,000 persons going by the estimates of our community leaders over the years,” he said. “Two million, one hundred and fourteen thousand (2,114,000) persons have become internally displaced as at December of 2016, with five hundred and thirty seven thousand, eight hundred and fifteen (537,815) in separate camps; 158,201 are at official camps that consists of six centres with two transit camps at Muna and Customs House, both in Maiduguri. “There are 379,614 IDP’S at 15 satellite camps comprising Ngala, Monguno, Bama, Banki, Pulka, Gwoza, Sabon Gari and other locations in the state. 73,404 persons were forced to become refugees in neighbouring countries with Niger having 11,402 and Cameroon having 62,002. Unfortunately, tackling Boko Haram insurgency was one of the main promises President Muhammadu Buhari made during his March 2015 presidential campaign. However, in the first month of Buhari’s presidency, the death toll of Boko Haram victims was still rising day after day, while the number of killed militants has fallen significantly compared to that of former President Goodluck Jonathan’s last month in office. In the first month after the inauguration of President Muhammudu Buhari, about 500 people, including soldiers, were killed by Boko Haram forces through bombings, beheading and shootings. At the same time, reports from official quarters shows that the federal authorities tried to set the Boko Haram death toll too low. The real death tolls in Boko Haram suicide bombings turned out to be much higher than it was declared officially at each blast. For instance, two months after Buhari came in to office, while immediately after the bombings linked to Boko Haram, 54 people were officially confirmed dead; the next day the death toll rose to no less than 117 – more than twice that was declared officially immediately after the blast. Of all the killings across the country, what has baffled Nigerians is the rate of mayhem in Benue State and why the combined efforts of the military and police have failed to restore sanity to the troubled state. The latest was the gruesome murder of two Catholic priests and 17 worshipers inside the premises of the church. Worried by the ugly development, former Benue State governor and now sitting Senator, George Akume said despite the military presence in the state, there is no end to the wanton killings and expressed worry that the latest attacks on worship centres have grave implications for the security and unity of Nigeria. “The monumental refugee situation now estimated at over 200,000, being faced by the entire state, particularly Benue North West Senatorial District, where all the 7 local governments of the districts are affected by these invasions and killings,” he said. Senator Sulaiman Adoke (Nassarawa APC) lamented that the axis of Benue, Taraba, Nassarawa and Kogi are now under attack. “Army was sent to the axis but to the dismay of everybody, the killings have continued. Some of the killings are happening 20 or 30 minutes away from army bases,” he said. Despite the failure of security agencies to stop the killings, the army and police were able to deploy dozens of troops to arrest IDPs who ‘pulled’ the governor when he visited, Adoke said. “But the real criminals are out there,” he added. A human rights organisation – International Society for Civil Rights and the Rule of Law, alleges that thousands of persons have lost their lives since 2015 when President Muhammadu Buhari assumed office. The group said what was most painful was that a larger number of those killed were non-Muslims, and that the killers were strengthened by the taciturnity of the present government. In a recent research material released by the group and signed by its Chairman, Board of trustees, Mr Emeka Umeagbalasi, it said that the killings were mainly committed by Boko Haram and Fulani herdsmen, who were empowered by the false labelling of innocent citizens, misrepresentation and distortion of facts by a section of the society. 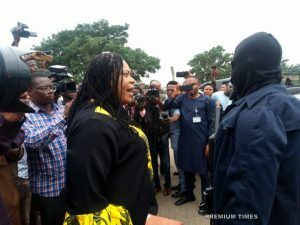 The group said lopsided security appointments by the present Federal Government had also continued to fuel and escalate the attacks and destructions carried out on Christian faithful and other non-Muslims and their sacred places of worship in Nigeria especially since mid-2015. “This is totally condemnable and despicable. It is recalled that the Janjaweed Jihadism or Jihadist violent attacks mostly targeted at Christians and other non-Muslim populations in Nigeria have resulted in the violent death or killing of not less than 7,850 since June 2015. In their separate reactions, the Senate and the House of Representatives have resolved to summon President Buhari to come and brief them on the steps being taken to combat the spate of killings across the country. The President of the Senate, Bukola Saraki, said the briefing by the President would afford the lawmakers the opportunity to know what was really going on as regards security. After the briefing, the Senate would then consider and take a position on the call for a state of emergency in Benue, and on the status of the service chiefs, Saraki said. “Going through these prayers (of the motion) that I see here, they really do not mean anything or touch the direction. We were here when Senator Gemade (Barnabas) came up with a motion on Benue killings sometimes ago. Now, it is Senator Akume (George). Then we were talking about herdsmen and farmers, now we are talking about herdsmen and religious leaders,” he said. Saraki warned that the latest dimensions to the killings, portend serious crises for Nigeria if drastic actions are not taken. “These killings on a daily basis have to stop. What do we do? We cannot continue to say we are leaders. This is a failure, no doubts about it. We have made ourselves available and we have done a summit. What do we do differently? It is amazing that not even a constable or an officer has been held and sanctioned for this kind of thing. It cannot continue like this,” Saraki said. The resolution of the Senate followed a motion by Senator George Akume (Benue APC) on the continued killings in the state, which he said have continued unabated since January 2018. In a strongly worded statement recently, President Buhari urged Nigerians who have been bearing the brunt of unparalleled violence in the country to look beyond the surface, as agents of disunity may be at work. “Repeated acts of mass killings and destruction in parts of the country and Benue State in particular, point to the evil design of enemies of peace and unity who have desperately been trying to bring the country to this sorry point: a brother killing a brother, a neighbour killing a neighbour and a community attacking and killing members of another community”, President Buhari said in the statement by senior media assistant, Garba Shehu. President Buhari thus urged all Nigerians against playing into the hands of the agents of disunity and vowed to fish out “these barbarous mass murderers and their clandestine sponsors”. President Buhari said those behind the Church attack that left 18 people dead, including two priests, did not mean well for Nigeria and peaceful coexistence. “The revenge attacks that followed in which 11 members of the Hausa community were killed is part of the agenda of the bandits and their sponsors to turn Nigerians against one another. We must resist all temptation to fall into this laid out plan. The President reiterated that the government will not rest on its oars in its determination to fish out these barbarous mass murderers and their clandestine sponsors. President Buhari equally assured Nigerians that measures being put in place by the government will, sooner than later, bring to an end, these extremely brutal and wanton killings.